One of my very best friends Jessica lives in Sacramento, CA – she’s my running buddy and we’ve ran many half and full marathons together. Jessica is 13 years younger than me and she is a serious ball of energy! She lives a gluten free, vegan lifestyle. 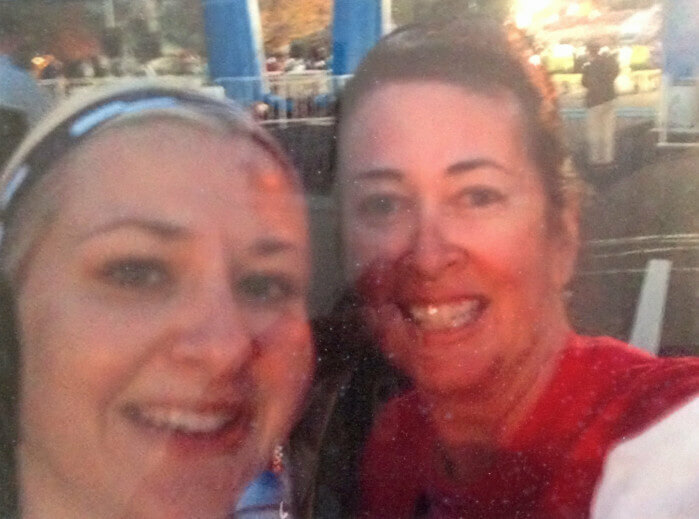 Jessica & Deb at the start of the California International Marathon – Not a great pic I know, but we were the worse for the wear at the end, 26.2 miles later! One day we were on a quest for something (heaven knows what?) – Jessica was driving (like a crazy gal as always) and all of the sudden she cuts across three lanes and swerves into the Walmart parking lot and up to a little pushcart with a large rainbow umbrella. Time for lunch she announces! Ok…I’m looking around thinking….where…what? Well the pushcart has piles of fruit and a woman with a very large machete is peeling pineapple, watermelon, cantaloupe, mangos, oranges, cucumber and jimica. That girl had serious skills with the machete! When she was done, she piled all of them in a large plastic glass, sprinkled chili powder and drizzled with half a lime. She stuck a fork in it and said $5! Best lunch ever, from then on, I brake for rainbow umbrellas! 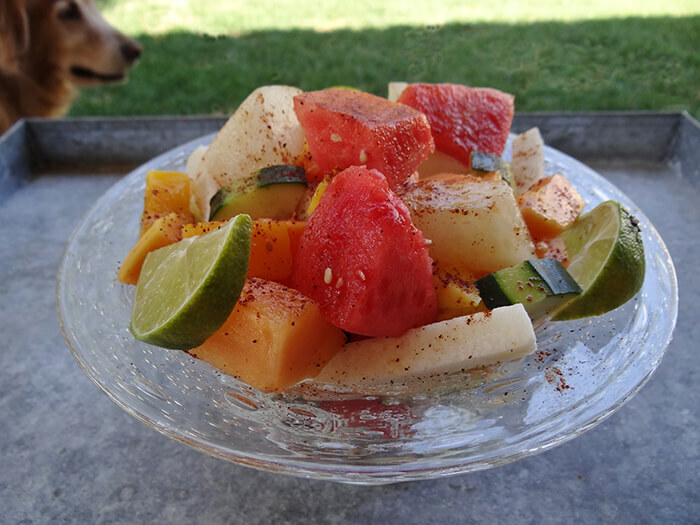 Bad news is….they don’t do this in Fresno, so I’ve began making my own rainbow fruit salad. The only thing I’ve changed is I don’t like pineapple. Ever since I was a little kid – I think it’s the only thing in the world I won’t eat. Yes strange, I know, but that’s just me. So when you make this, cut up the fruit and vegetables and sprinkle them liberally with chili powder. Don’t let the heat scare you. The sweetness of the fruit balances it. Squeeze a couple fresh limes right over the top and sprinkle with a pinch of salt. Perfect lunch – truly doesn’t get much better than this and if you’re going to a bbq, this is a great salad to share. 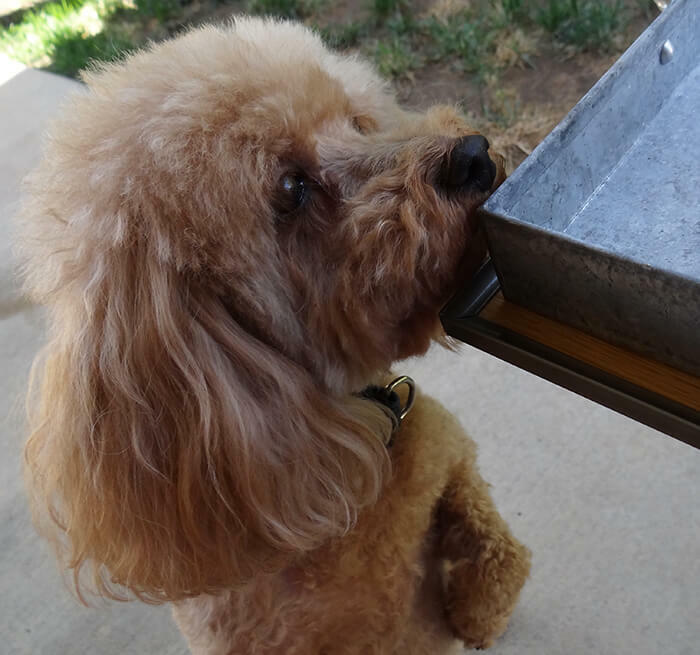 Then there’s Max who is much more aggressive with his begging! Great lunch or an easy salad that's wonderful for a cookout on a hot summer's day. 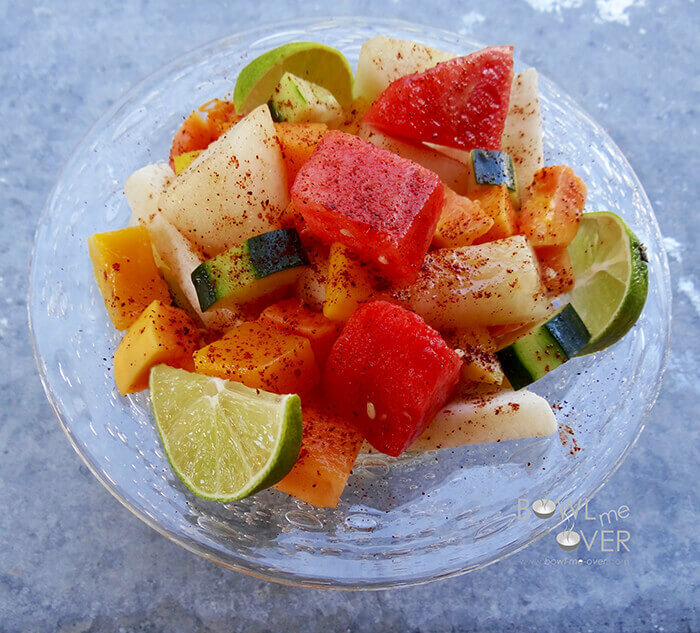 Rainbow fruit salad combines fresh fruit & veggies for a real treat! 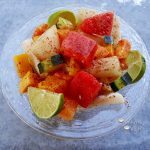 Very simple, peel and chop all fruit into large chunks. Pile in a bowl, squeeze 2-3 limes over top and sprinkle liberally with chili powder as shown above. Finish by sprinkling just a touch of salt about 1/2 teaspoon over the salad. Perfect for lunch, also great to share at a cookout! Made this salad yesterday for company lunch. Everyone LOVED this…even non -chile lovers. Great treat for a hot day. It’s one of new favorites. Wow, the chili powder sounds like the perfect kick for this delicious salad. 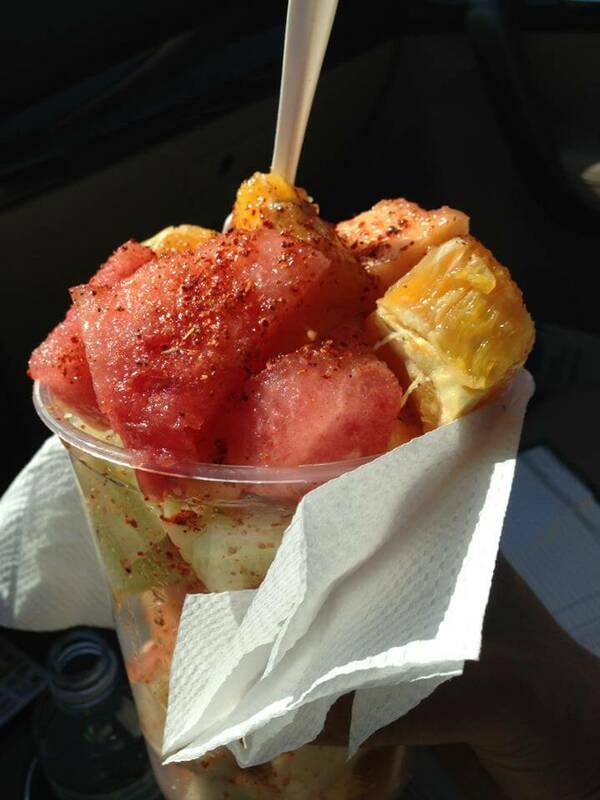 chili powder on fruit is SO GOOD. 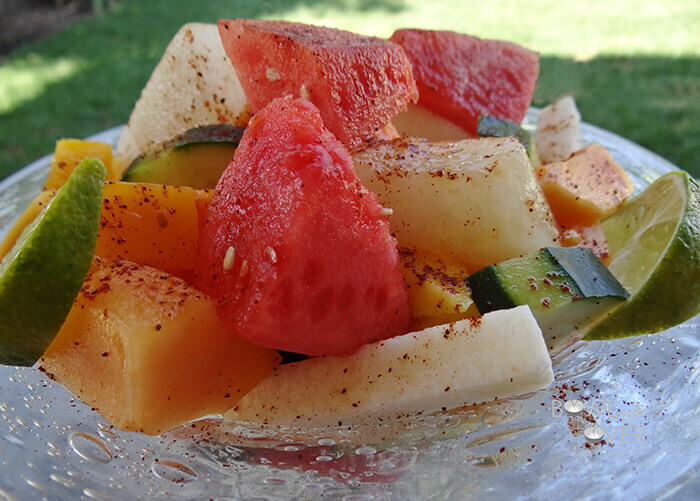 reminds me of spending summers in Hawaii, we sprinkled chili powder on papaya. So true, unexpected but a GREAT combination! I’m going to have to try this with the chili powder. I would have never of thought to try it like this. I’m on the lookout for rainbow umbrellas in San Diego, just in case. 😉 Luv your helpers, Brodi and Max! Brodi & Max say hi Christina! 😀 Good luck finding the umbrellas, it’s such a treat!! The chili powder adds an awesome pop of flavor! I am going to try this! I hope you do Marye – we just love it! I am totally want to try this now. I can see how it would be so refreshing and delicious. Oh I love your story telling behind this salad. Sounds like a fun day and really makes me want to try this. There’s nothing like this where I live either!